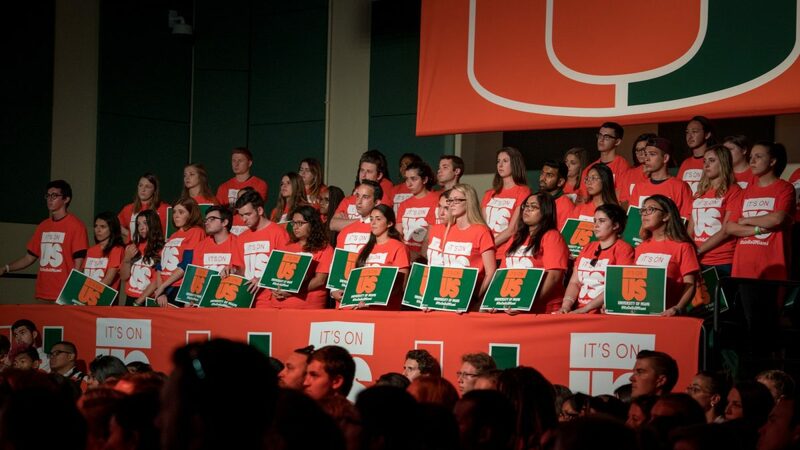 Former U.S. Vice President Joe Biden praised University of Miami President Julio Frenk’s initiative to “step up” in creating an anonymous school climate survey to combat sexual assault during his address at the university’s It’s On Us rally. “President Frenk, I’m proud,” Biden said. Frenk announced the launch of the third annual UM campus climate survey aimed at measuring student experiences and attitudes about sexual violence and available “prevention and awareness” programs and resources on campus. The survey was officially launched in 2015 by the President’s Campus Coalition on Sexual Violence and Prevention. 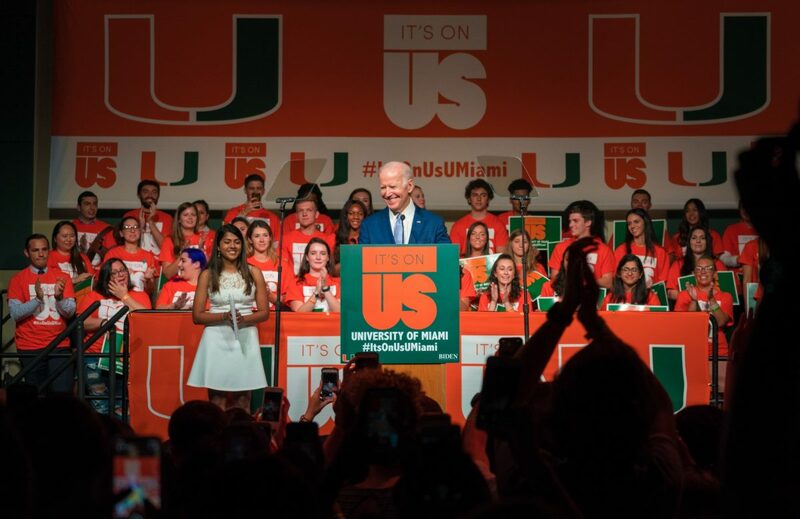 Biden was the keynote speaker during UM’s It’s On Us rally against sexual assault on March 20 and said several years ago he met with over 100 college presidents. He said the college presidents weren’t “particularly excited” about what he had to say about the prevalence of sexual violence on college campuses. However, he said Frenk was one of the “few presidents” who has “stepped up” and created an anonymous campus survey to gather information on the issue. Frenk, who took the stage before Biden, said the issue is of the utmost importance to him. “Preventing harassment of any kind is a top priority for my administration and for me personally and this remains true regardless of outside forces or rhetoric,” Frenk said. The It’s On Us rally, derived from the social movement named ‘It’s On Us’ created during former President Barack Obama’s tenure in 2014, aimed at raising awareness and creating a safe environment without any sexual or gender-based violence. Biden, the 44th vice president of the United States, was invited to speak at the event where he detailed his experiences to end violence against women. During his speech, Biden said it was his father who motivated him to “set out to rip the Band-Aid off” the secrecy behind sexual violence against women and men. Biden said, even as a child and young adult, his father would tell him “the abuse of power” was the greatest sin of all. Biden called on students, both men and women, to set a new standard and change the cultural norms that have seeped their way into society. He also called on student organizations such as Greek Life to take leadership roles in the fight against sexual violence. “Well guys, any man on campus who sees a fraternity brother taking a drunken co-ed upstairs and doesn’t walk up and say, ‘Not in my house’ is a damn coward,” Biden said. In fall 2017, Vice President for Student Affairs Patricia Whitely called a mandatory meeting for all members of Greek Life for a “candid conversation.” About 1,500 members of the Greek community attended the event throughout the night. During the Panhellenic session of the event, Greek women cited sexual assault as their “number one concern for safety affecting the UM Greek community” in a poll taken during the night. For junior Violet Sullivan, who spoke at the rally before Biden, sexual assault became a reality for her during her freshman year. Sullivan said it was Oct. 31 when she and her friends attended a Halloween party. “I never could’ve expected that the monsters this year would no longer be costumes but my worst reality,” said Sullivan, a psychology major. Though Sullivan, choking back tears, said the experience was tiring and difficult, she wanted to speak out so another woman wouldn’t have to go through her same experience. “I am not a public speaker and this is honestly terrifying, but I will gladly stand up here and tell my story if it means that another person in this crowd never has to,” Sullivan said, choking back tears. It’s stories of young women like Sullivan that keep Biden going on the fight against gender-based violence. Biden called on all students to take the It’s On Us pledge and tell other students about it so together, the culture changes.